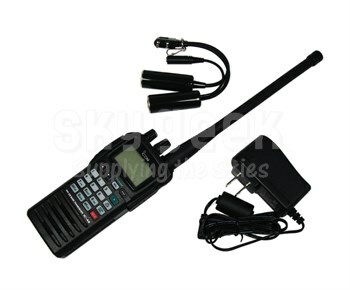 SkyGeek.com proudly offers the ICOM IC A6 Handheld Air Band Transceiver, a powerful and compact little device packed with features sure to impress any pilot. Combining simple, intuitive operation with a rugged, reliable design, the ICOM A6 is the successor to the A23 and the A5. With a capacity of 200 memory channels and a variety of scanning functions, the storage on this baby is stellar. Other goodies include an external DC power jack and may be hooked up to a cigarette lighter plug. Unlike many of its kind, you can simultaneously charge and operate the ICOM IC-A6. The ICOM A6 also boasts a side tone function that allows you to hear your own voice in a headset to prevent unnecessary shouting on a noisy runway. Finally, ICOM recognizes safety first. The ICOM A6 is water resistant and remains reliable in wet conditions. Additionally, the device has a dedicated red emergency key programmed with a homing frequency in case of an emergency. Read what others are saying about this innovative new transceiver in the ICOM IC-A6 Reviews section, or write your own opinion! The ICOM IC A6 comes equipped with a Ni-MH battery, wall charger, antenna, belt clip and headset adapter.